One of the great things about winter is that all of a sudden I have develop a craving for heary stews and chunky roast joints of meat. Somehow, these just don’t seem to be appropriate in the summer, but as soon as the weather turns chillier they take on a whole new appeal. Apart from their general deliciousness, there is also the ease-of-cooking aspect, because in both cases the long and slow cooking time means that I get to pop something in the oven, go upstairs, take a bath, have a glass of wine, check e-mails and all of a sudden dinner is ready! Like magic. Last week, one of the more comforting meals we had was Nigel Slater’s wonderful slow-roast lamb on chickpea mash (soon to be blogged!). This meant that for most of the week, there has been a giant lamb bone with the last of the meat clinging to it sitting in my fridge, daring me to make something with it. Now if it were summer, I would probably have been making lamb and chutney sandwiches for work every day, but seeing as it’s pretty chilly out there, I’ve been gorging on soups from EAT instead. Because we are going away this weekend, though, my mind has recently become more sharply attuned to what’s in the fridge and how I can use it up. Hmm, let’s see… leftover roast lamb, half a punnet of chestnut mushrooms, some cream… Bingo! Lamb Stroganoff! 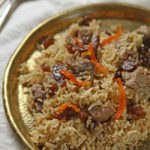 Seeing as I chucked tradition out of the window when I started cutting up the cooked lamb instead of raw beef (! ), I guess I have some leeway as to the ingredients, but I tried to stick to the meat-cream-mushroom formula. And it turned out pretty damn well, even if I say so myself. NOTE – as I was making this up as I went, quantities may not be exact. Increase or decrease as you see fit. Cube the lamb, crush the garlic and slice the onions and mushrooms. Heat the butter in a heavy-bottomed frying pan and sautee together the onions, garlic and lamb. If the lamb is cooked like mine, sautee the onions and garlic until the onions are translucent and beginng to brown, then add the lamb to heat through. Add the mushrooms at the very end – they need minimal cooking. 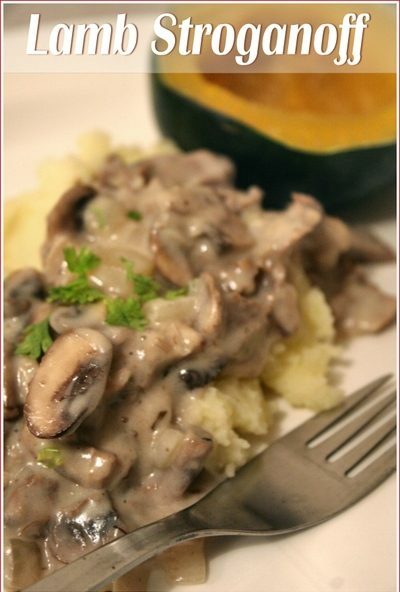 Stir the lamb, onion and mushroom mix into the sauce, heat through and serve on a bed of creamy mashed potatoes. And, in my case, with gem squash on the side! I won’t even tell you what the first stroganoff I had consisted of….but, hint: it involved opening cans….. This sound lovely – and a perfect use for the leftover lamb….one can’t always make risotto…. And perfect with that little squash! 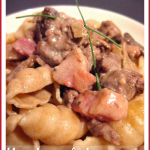 I’ve never been a fan of lamb but that stroganov looks awfully good! Whenever we are about to serve stroganov (beef) I can never decide if it would be better with mashed potatoes or with egg noodles tossed in butter and poppyseeds (whichever one of those we choose is always my favourite…). P.S. That’s really interesting, Pille. I always thought that mushrooms were an essential ingredient in stroganov. I just read a recipe for Beef Stroganoff and was thinking about other proteins to use the recipe with. 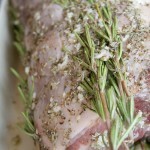 The thought of Lamb is lovely! Thanks! Elena Molokhovets’ classic Russian cookbook (1861) gives the first known recipe for Govjadina po-strogonovski, s gorchitseju “Beef Stroganov with mustard” which involves lightly floured beef cubes (not strips) sautéed, sauced with prepared mustard and bouillon, and finished with a small amount of sour cream: no onions, no mushrooms. A deliciously savory post (Greenman Tim brought me here). It wsounds like a great recipe (which I am trying) but you don’t mention when to add the paprika & rosemary! Hi! I tried this last night and it was fantastic! I added a really small amount of tomato paste and a bay leaf, and served with fettucine. Lovely! Was much too creamy for us and lacked the “bite” that sour cream usually lends. Nice texture but not much flavor. Thank you for the recipe. I was looking for something different to do with leftover lamb other than shepherds pie. Will make tonight. I have a chunk of Lamb left over from Easter! Yay me! Making lamb stroganoff!